Qualcomm has just acquired EPOS Development, a company known for working on ultrasound technologies, and it confirmed that future Snapdragon chips will use the company’s insight. The Snapdragon chip is common on Android, and it is the one chip powering all Windows Phone devices. Epos’ technology could be used for stylus and gesture recognition, and possibly even move away from the now dominant touch interfaces. “EPOS technology is based on the transmission of ultrasonic acoustic waves between two or more devices via a Transmitter and a software-based Receiver. The Transmitter, embedded within an input device, sends constant acoustic signals to the software-based Receiver that in turn, uses them to measure the distance and position of the pointing device. 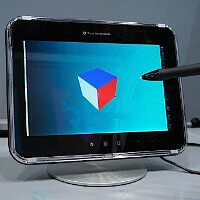 What this means is that the ultrasound technologies works in three dimensions, both on the display and off of it. Thus, you could just use gestures in the air to control the device. To give the new technology a boost in consumer electronics and the educational and enterprise markets, Qualcomm will provide stylus reference designs. EPOS is a hint of what’s to come eventually after touchscreens. Touch-free and pen interactions a la Minority Report might not come en masse next year, but the technology is definitely already there. And given the fact that Qualcomm recently surpassed Intel in its market value, we could well see this kind of innovation from it. SAN DIEGO, Nov. 16, 2012 /PRNewswire/ – Qualcomm Technologies, Inc. (QTI), a wholly owned subsidiary of Qualcomm Incorporated (NASDAQ: QCOM), today announced that it has acquired certain assets of EPOS Development, Ltd. (EPOS), a leading developer of ultrasound technologies for input solutions, including pen, stylus and gesture recognition. The company, based in Hod Hasharon, Israel, has developed digital positioning technology that enables device manufacturers to integrate advanced user input capabilities into a wide range of consumer devices. The acquired assets will further strengthen and differentiate Qualcomm’s Snapdragon processor, allowing unique and powerful next-generation user experiences for smartphones, tablets and e-readers. EPOS team members who are joining Qualcomm will be integrated into Qualcomm Israel’s R&D team and will be focused on delivering new mobile device and service capabilities. The EPOS technology is based on the digital transmission of ultrasonic waves, enabling precise tracking by a receiver to enable multiple applications. EPOS’ ultrasound technology provides a differentiated, high-resolution user experience that works on screen and off screen, as well as in three dimensions. Qualcomm intends to provide digital pen/stylus reference designs to help accelerate adoption of this technology in the consumer, enterprise and education markets. EPOS Development, Ltd. is a leading provider of advanced digital positioning technologies. Headquartered in Israel and backed by Jerusalem Venture Partners (JVP), Walden Israel Venture Capital and Tel-Ad, EPOS develops next-generation input solutions for consumer electronics and mobile devices. That is some cool tech. I imagine it will go into direction of virtual gesture interfaces like in movie Minority report with TOm Cruise.. Remember that computer ?? Finally the middle finger will work over the air. Uh.. better get a patent on that before Apple invents it next! doesn't matter if they patent the technology. apple will just patent the use of it. so they should patent both the use and the technology. This will be good tech for soon to be medical apps where doctors and other practisioners can view a live 3D organ and move it around in real time.